When I say this recipe is stupid easy, I mean this in the best way possible! So needless to say this recipe is stupid easy as long as you can get everything easily at the store. 😉Which if you live by a decent grocery store or health food store you should be able too. This will be a great crowd pleaser for the Super Bowl! My husband who can eat gluten and dairy to his heart's content, ate almost the entire dish during the pro-bowl the other day. First, give yourself a little extra time to let the spinach thaw. Squeeze as much moister/water as you can out of it and set aside. Also drain quartered artichokes, pat dry, and set aside. Pre-heat oven to 350 degrees.Spray with oil, a 1.5qt dish ( or something similar size) and set aside. In a separate bowl mix mayo, cream cheese, and parmesan.Then add in the artichokes, spinach, onion, and garlic and mix to well blended.If you feel it's not "creamy" enough. Add a tad more mayo. I ended up adding 1 tablespoons more to my dish.Transfer mixture to your sprayed dish. Sprinkle paprika and parsley, and more parmesan to taste.Place dish on a cookie sheet just in case anything decides to spill over. Place dish in oven and cook for approx. 30 minutes. Once the top is golden brown and the sides are starting to bubble, pull out and serve once cooled slightly! *I made a homemade vegan parm (Cashews and Nutritional Yeast) - but you could use store-bought as well. Have a great Super Bowl Friends! GAH YESS! Yummm! Dairy-Free for me please!! Friggin' LOVE SPINACH so bring it on! And sooo perfect for the upcoming game (that I don't give a crap about, LOL)..... Is it weird that I wanna dip grilled chicken into this?! One of my favorites! Even better that it is this easy to make! 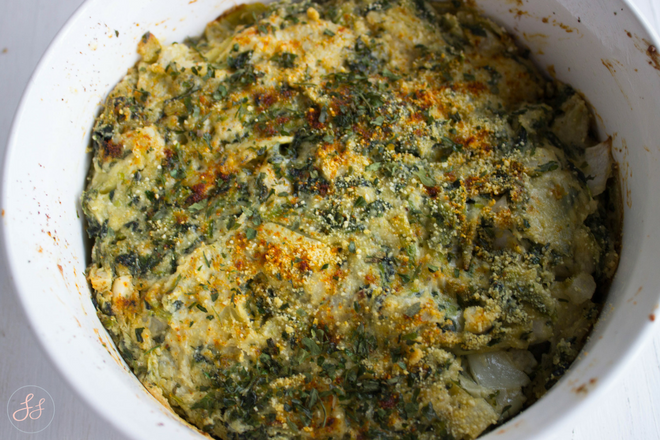 I love spinach artichoke dip but I don't eat it too often because of the cheese. This looks GOOD and definitely stupid easy!! Hi Samantha! 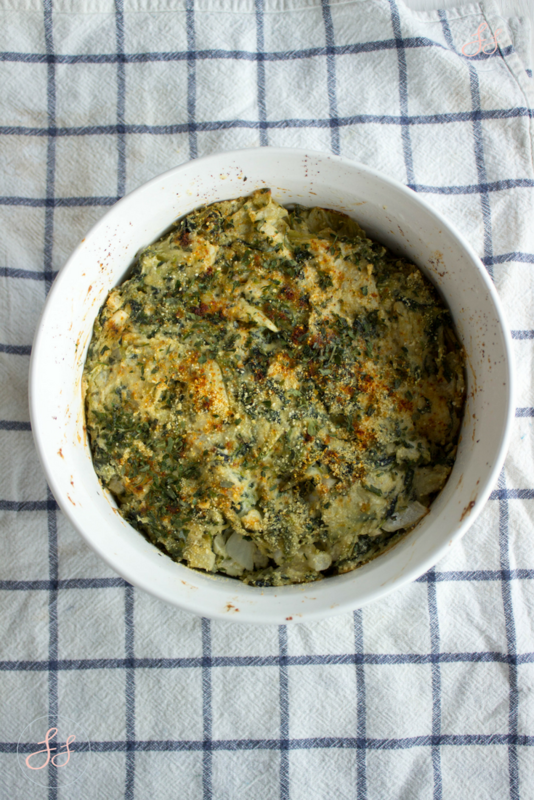 I love Spinach Dip! This really does sound super easy. Can't wait to try. Ohhhh I am always on the look out for healthy versions of my favourite decadent dishes. Thanks for sharing. What a great dip for Super Bowl! Love how easy it is to make. The fact that your husband ate almost the entire bowl of this dairy free option says it’s definitely a winner! 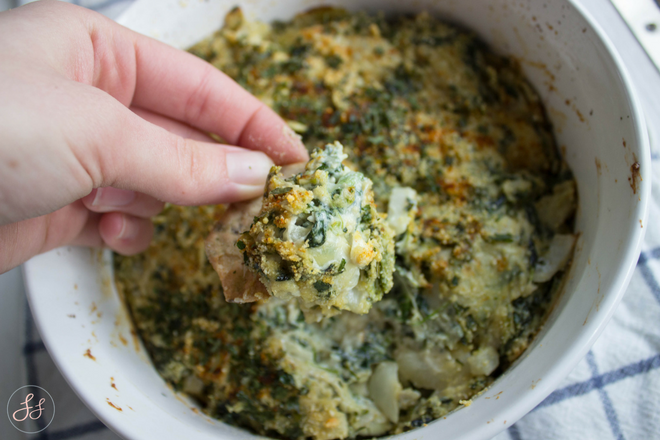 Spinach artichoke dip is one of my all time favorite appetizers...or any-tizers. ;) It's just so good! I can't wait to share this DF version with some of my pals that are DF. This sounds and looks soooo good. I know my hubby will love this for our movie night. Saving this to try. hahaha, "stupid easy" should definitely be a category in the food blogging world! I'd follow it like nobody's business! This dip looks super good and that's awesome that you managed to make it dairy-free! This looks really good! I miss having spinach dip, so I'm thinking this would work! Maybe someone will make it for me sometime ;-). wow its look amazing & healthy dish i love it keep posting..